Program includes affirmations and yoga poses, Indian Fusion, indigenous belly dancing, and Qigong. The truth is we all have some form of self-sabotage that keeps us from the happiness we deserve. Endorphins Mind & Body Collection has released a program to help people suffering from anxiety to calm the mind and rejuvenate the spirit. If someone is suffering from a condition known as Generalized Anxiety and there are concerns about taking addictive medications, there are alternatives. Anxiety symptoms may include sleep disturbances, muscle tension, inability to concentrate, and uncontrolled worry. The truth is that everyone has some form of self-sabotage that keeps us from deserved happiness. As a society, people must be more proactive and start focusing on their right to wellness. When the central nervous system is dysfunctional, suffering occurs, leading to anxiety, insomnia, depression, or worse. The Endorphins Mind & Body collection is a tool to help heal. Practicing these harmonious programs can mend the wounds that keep people separate from themselves. The fast pace of today’s world requires people to be mindful of their states of consciousness. Stressors in the aggressive environment deplete them, creating disease. Physiological and mental health depends on the ability to slow down and unblock. The key to well-being can be found in the body itself. When exercising, the body releases chemicals called endorphins, which trigger a positive feeling in the body. Endorphins act as analgesics and diminish the perception of physical and emotional pain. Excessive worrying is a typical Generalized Anxiety symptom. Practicing this series will enable people to dissipate their fears naturally. Endorphins are released in response to brain chemicals called neurotransmitters and are manufactured in the brain & spinal cord. As a wellness program, The Endorphins Mind & Body collection features four fitness DVDs comparable to indigenous modalities that improve vitality, health, and self-worth. 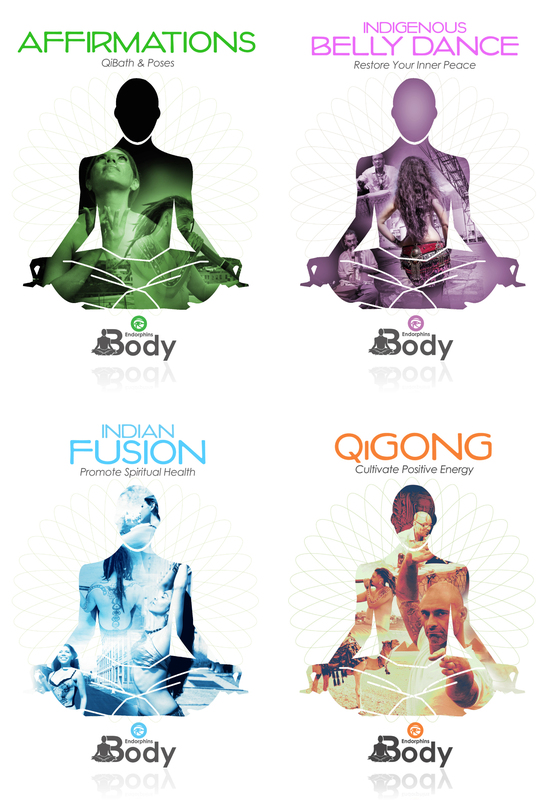 Available in this harmonious series are: Indian Fusion, Affirmations with Yoga poses, Indigenous Belly Dancing, and Qigong. Affirmations and yoga poses instill a healthy internal dialogue necessary for well-being. Positive self-communication and how people speak to themselves filter out negativity. Affirmations are repetitive statements that discipline the mind to manifest what it desires. A yoga pose is intended to increase the flexibility of the spine, a key important factor in maintaining a healthy lifestyle. Indian Fusion are Mudras: choreographed hand gestures, with origins in Indian mysticism. When combined with modern dance and breathing techniques, these invigorating exercises calm the mind and rejuvenate the spirit. These dances require hand-eye coordination and stimulate neurotransmitters in the brain. In an age of over-medication, these symbolic gestures provide a natural way to affect inner states of consciousness. Indigenous Belly Dance stems from movements historically used to prepare women for childbirth, in a tradition passed from mother to daughter. This tradition teaches people to embrace themselves, to respect their bodies, intelligence and trust their innate abilities. Qigong is an ancient Chinese healing dance performed by both men and women that expels pathogens from the body. Qigong is a series of physical movements; a form of "medicine" that uses oxygen as food, fueling the body. In Sanskrit; an indigenous language "Qi" means life force, "Gong" means skill. For more information, visit http://www.endorphins-body.com/. About Yvette Vega: Endorphins Mind & Body collection is Executive Produced by Yvette Vega. Vega currently works as a Director for Neurobehavioral Research, which specializes in clinical trials for Generalized Anxiety, Major Depression, Bipolar Disorder, Alzheimer's disease & Schizophrenia. Vega began her fitness career as an aerobics instructor more than twenty years ago. She received so many accolades from her students that she was urged to become an Aerobic and Fitness Association of America (AFAA) Certification Specialist, training thousands of instructors worldwide. Vega is an Award-Winning Filmmaker, Yoga Teacher, Researcher, Belly Dancer & Entrepreneur. Musicians, Choreographers, Instructors, Creative Directors, Photographers, Cinematographers, please view http://www.endorphins-body.com/credits.